This altarpiece is something of a mystery. Nothing is known about the man who commissioned it or its original location. The inclusion of full-length saints indicates an important patron and an expensive commission. 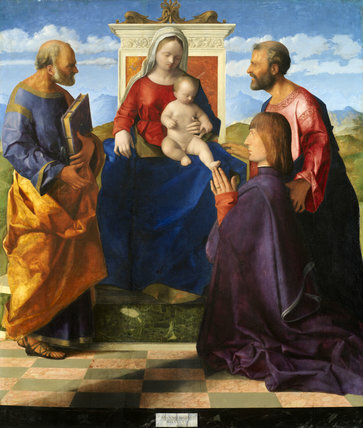 Though the work is signed on the scrap of paper or 'cartellino' by Bellini, its production would have involved the work of assistants in his studio. Bellini's own hand can be detected in the animated naturalism of the heads of the two saints. Purchased by public subscription with contributions from various trusts and funds.